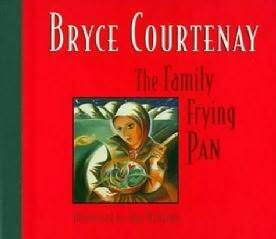 I have several frying pans myself. The cast iron ones are harder to clean than teflon, but do a better job on the peskier varieties of supernaturals. At least the ones silver doesn't work on. We got good news about Catalyst today! Enough of them found homes that the publisher has gone back to press for another 1,500 books making a grand total of 16,500. This is within a month of publication and in hardback so not bad! Annie is very pleased as am I. That good to hear Speaking of cast iron type I've got on tape somewere how to season on, got a old fashion iron makes square ones you plug in and I need to do it. Is it a new book, Jube? Congratulations to you both!!! That is wonderful news! A second printing run already, fabulous! No Eann, it came out several years ago, in several formats. If I can find a copy, I'll send you it as you'll find it quite interesting. 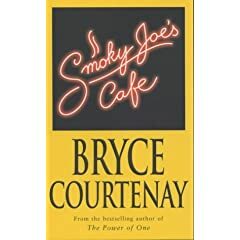 There are a very few of Bryce Courtenay's books that I like but I did enjoy this one as well as "Smoky Joe's Cafe". He's an Aussie author who originally came from South Africa when he was a "spring chicken"
Congratulations on the 2nd print run, Eann! Want some inspiration for future Barque Cat books, Eann? That is GREAT news, Eann! OK, everybody, please put your hands together and give that woman a major round of applause. That's a reprint of a HARDBACK BOOK, gang! That hardly ever happens, it's fabulous!! Annie - superb news about the reprint! WOW!! And I can see why, having just finished it. Catalyst is a great book, not just a fun story but SO right about the cats! Fabulous stuff, Annie, I enjoyed the heck out of it. May it be a wild bestseller and keep you, the cats and Herself in the style to which you would like to become accustomed! Thank you, Lanen, on behalf of Pancho, Cisco, Herself and myself. . .glad you enjoyed it. I hope you read some of the cattier bits to Zorro and Midnight? Glad it arrived okay too! I hope you read some of the cattier bits to Zorro and Midnight? I bet Eann wasn't expecting THAT! I need to brush up. I thought he was demanding fishie treats! Lanen: you really need a girl-cat called Joy. Then, when you dish out the fishy treats, it's one for Zorro, two for Joy. Any for Midnight? Did I know something I'm not sposed to know, Lanen? And why does Joy, who doesn't even exist mind mew, get two when Zorro only gets one and poor Midnight doesn't get any? Careful, Lanen, or your Cats' Local Union will be picketing you. Eann it came today, safely and Thanks for the book, I hope to enjoy the audio book, I can still read print, but my eyes tire out so fast, s say hi MEOW to you all, I do hope to order a hardback for I can read that easier that I can paperback, eann had a few spair copies of on cd and send me a copy, with a sign sticker for my scrapbook collection, mostly its singer but I do have one writer who is local and knows some my kin, he writes about Wisconsin early histroy, GinnyStar *crying if I had spair tears at the moment* The way the cat's head is cocked remind me of Peanut, miss him. Also the ears. If Smokey was here I don't know if hear him, not unless he want something badly, many a times he has open his mouth and nothing or a little squeak would come out. not quite what I had in mind, but this dratted problem with my brain and its link, and I was showing Dan J. and my body froze and I end up landing on top of him in his chair tipping in forward, lucky both didn't get hurt. And he about got his head "Smokey" in the mailer eann send me. in a way to read/listen to eann and amc new book. Midnight hasn't discovered this forum. I climb over Lanen when she is sitting at her shiny screen, but Midnight just walks over the keyboard and jumps onto the window sill. Okay Zorro: hows about some nice corn-flakes? The ones that make really crunchy noises when you bite them. Or some nice creamy fudge? In my case listening, to it, I like how she was done, I like her son Doc I think, I shall have to the print copy so folks know what I am trying to say. Dan J. might want to listen to it, he like stories with cats in them. Not too sure on the space thing but he like the unknown. If they'd just buy another book I could have one of Git's grandkittens from Doc, Wyatt or Bat as a Git-throwback. "My granny was a working cat but my granny on the other side was a Prin-CESS." Or another way, depending on how one was a ground pounder, working cat, and other one was a space faring kind that adopted me while ground side. Ahhh, but that's not the case, Ginny, as far as the other grandcat goes. But for that you will have to see book 2.